Project Management Professional has been given since 1984 by Project Management Institute (PMI) – a non-profit organization founded with the purpose of developing the most advanced project management skills. PMP is an international certification that recognizes the knowledge and the leading skills, the project team management to implement projects. PMP standard requires project manager (PM) has to achieve the perfect level in most of fields, with the ability to manage major projects. To imagine the scope of project which is comparable with project costs in millions dollar or more, project group can have more than 200 members working at several countries. 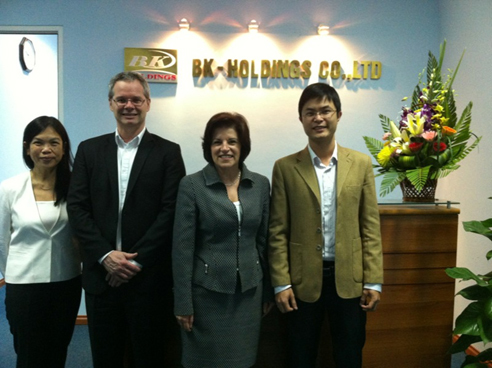 Recognizing the importance and demand of PMP in Vietnam, BK-Holdings has signed a memorandum cooperation about training PMP in Vietnam. Quebec University in Montreal (ESG UQAM) is one of the top 100 universities training management in the world and is recognized by EQUIS (European Quality Improvement System). According to the memorandum, Quebec University in Montreal will cooperate with BK-Holdings to train PMP in Vietnam. With the instructors are PMP experts in University ESG, each course will occur in Vietnam within 1 week. In March 8th 2013, the Representatives of Quebec University in Montreal including Pro. Ginette Legault - President and Mr. Maltais France - Centre Director (Executive Education Centre) came to visit and work with the Representatives of BK-Holdings.